Saturday 23rd Aug.t – when I got up this morning, I beheld the island of Teneriffe. This island seems to be more rocky and precipitous than Madeira – and is not so beautiful by far. At first we could not see the celebrated Peak of Teneriffe for the whole island was shrouded in thick mist, during almost the whole day, we lay off and on Oratava – the capital of Teneriffe which seems to be pretty, tho small. You being told that we were merely to land the mail and proceed we did not seek to go ashore till it was to late. In the afternoon the weather cleared up and we then obtained a sight of the peak, which is more than 12,000 feet in height – above the level of the sea. From our close proximity to it, it did not strike us with that idea of sublimity and grandeur which we had been confidently led to anticipate receiving from it. Nevertheless it was a fine object to contemplation – and I felt glad to be now able to say that I had been near the foot of so celebrated a mountain. At 6 oClock P.M. we left Teneriffe and when about 30 miles distant, we then saw that view of the Peak, which is calculated to impress the mind with admiration and awe. For in by mild but clear light of the moon, towering far in majestic height above the Island. It was indeed a most magnificent sight – and not soon will I forget it. The appearance of it was something like this (see illustration). Monday 25 Aug.t 1828 – this morning was very warm, so that I perspire much without exerting myself. Today for the first time saw the flying fish. These are about the size of our herring with two fins near the head so large – that when spread out they will support the fish in the same way as the wings support a bird. But these fish are so constituted that they cannot fly to any great distance – because their wings or fins require to be frequently wette. Some of them having fallen on the deck were next day prepared for breakfast, when we found them to be most excellent eating. Sailed at the rate of 5 knots an hour. The day was cloudy which moderated the heat. In the afternoon the rate was about 6 ½ knots. At night the Sailors furnished themselves with amusement at the expense of the miners. A bet was laid among them – that if one of the miners were put into a Sail and concealed in some private place it would be impossible to find him out in a given time. One of the miners was fool enough to allow himself to be enclosed in a sail and there secured. He was then conveyed to a private place – whilst one of the sailors, armed with a bucket of water pretended to seek for him – & for some time in vain. At last as had been secretly agreed upon, he was permitted to discover the unlucky wight whom he soon completely drenched to the skin by an copious and raped [sic-‘rapid’] effusion of salt water. Some other tricks were attempted to be played in which the miners were to have [come] off the worst – but the Captain at once countermanded them, observing very justly that jokes among men often bred bad blood. For these some nights past the appearance of the sea mildly lighted by the full moon attended with thousands of brilliant colourations never seen in our latitudes has been most beautiful – but I think I have observed that on these moon-light nights far more dew fell, than on those nights which were not so brilliantly lighted up. Tuesday 26 August – 1st part of the day cloudy and 2nd clear. 5 knots an hour – To day we entered the Tropic of Cancer. Wednesday 27th Aug.t – day fine and very warm. 7 knots an hour. Thermometer stands at 80 at 9 oClock P.M.
Thursday 28 – for these some nights past I have not been able to enjoy a sound sleep, on account of the excessive heat and closeness of my birth. To day weather cloudy – average rate of sailing 6½ knots an hour. Friday 29 – one of the Cape Verd [sic] Islands was in sight this morning called San Antonio – but it was so hazy that nothing could be seen very distinctly – and it seems to differ little from Teneriffe, though from its great and numerous irregularities abundant proof of an volcanic origin. 5½ knots an hour. Saturday 30th Aug.t – to day we have had rain for the third time only since we left Falmouth – and it was merely a passing shower, which cooled the air. The wind which has hitherto been so much in our favour has nearly failed, our average rate of progress being only 2½ knots an hour. Sunday 31 Aug.t – beautiful morning. Service was performed as usual at half past ten. I wonder how I have omitted to make particular mention of this before as the way in which it was conducted was highly satisfying to me – and totally different from what I had been led to expect from swearing, thoughtless sailors. At 6 oClock A.M. all the Men washed themselves thoroughly – put on clean clothes – and as soon as the 5 Bells tolled ½ past ten they quietly and soberly took their places on benches placed for the purpose. And during the whole time of service, which was distinctly and seriously gone thro’ by the captain assisted by me as Clerk, not the slightest noise was heard – but all seemed attentive to what was going on. At the conclusion each retired to his respective place – as quietly as they had come to service – there was no confusion – no noise – but all was decently and orderly. While I am upon the excellent behaviour of our men on Sundays, I may mention that no man is allowed to swear – and so rigorously is this attended to, that up to this time (a period of two months) . I have never heard a single oath or profane expression uttered by any of the crew. The Capt.n himself is strictly guarded in his own conversation – and it is only, when he is excessively angry or chaffed that something very like a good round oath escapes him. From all this, the plain inference is that in the whole service there is not one vessel, more distinguished for strict discipline & good conduct than the Duke of York, commanded by Capt.n R. Snell. 4 knots an hour. Thermometer 83 in the Shade. Tuesday 2d Sept.r – morning very gloomy and heavy showers have fallen during the night – which still continue. 6 knots an hour in the morning – much rain during the day & night. 5 knots in the afternoon. Thursday 4 Sept.r – at the same hour rained all to day – wind very variable sometimes brisk, and at other times sinking into a perfect calm. Friday 5 Sept.r – weather cleared up. Saw a very peculiar appearance to day viz. the Sun, Moon and a small but perfectly distinct planet – all at one and the same time – at ½ past ten oClock A.M. Sailed 80 miles. Saturday 6 Sept.r – rained all day – 120 miles. Sunday 7th – weather fine & pretty cool – saw immense shoals of porpoises sporting about the ship and vying with it in speed. Sailed 150 miles but not exactly on our proper course for the wind has been unfavourable. Monday 8 Sept.r – day fine and cool – wind still against us. Progress 80 miles. In the forenoon saw great numbers of porpoises and Bonitos both of them the enemies of the fly fish. One of the latter was caught by a harpoon, and laid expiring on the deck, enabling us to see the beautiful & various changes which take place a few moments before death – sometimes black, sometimes purple &.c This one was of the size of a large Cod, and its belly was regularly striped longitudinally, as if with a black-like ribbon. Tuesday 9 Sept.r – morning pleasant and cool, but day rainy. Wind almost gone but still unfavourable. 60 miles. At 4 oClock P.M. nearly calm. Wednesday 10th – weather cool – slight showers – sailed 58 miles. Thursday 11th – heaviest squall we have had as yet – the ship reels and rocks like a cradle, and the waves are none of the smallest. I do not feel any sickness and, therefore I consider myself as sea-worthy – this I mention because some of our number have been during every heavy swell – up to this day – 48 miles. Friday 12th Sept.r – nearly the same wind blows but is more favourable than before. Sailed 108 miles but made only 10 of southing. Saturday 13th – clear & pleasant in morning, wind nearly same. At noon the wind became much more favourable, and carried us in nearly in our direct course. Sailed 115 miles but made only 38 of southing. After the Sun had gone down, I witnessed a scene of beauty quite enchanting – the whole western part of the sky having numerous flaky clouds superbly tinged with purple and gold. 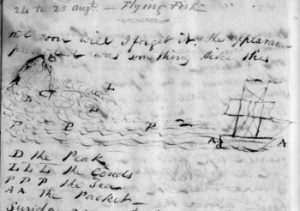 Sunday 14 Sept.r – fine wind and in our favour. 130 miles to day. Service as usual.